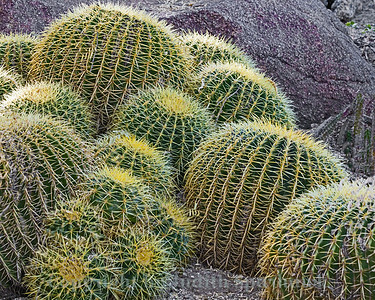 Cactus and succulents from gardens and in the wild. 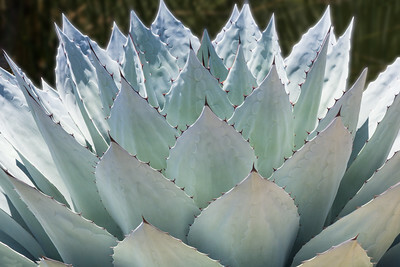 Spent the afternoon at the Los Angeles Arboretum today and had fun shooting a few of the plants there. 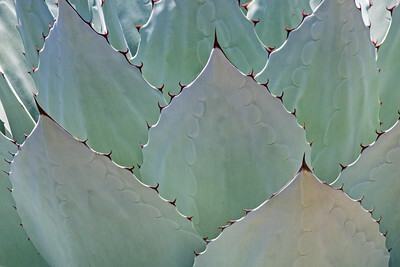 This very spiky plant appealed to me because of the symetry of its leaves. 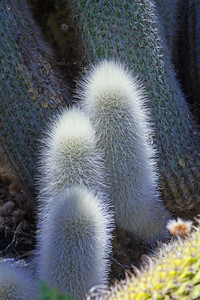 These soft looking cactus appeared to be new shoots on this cactus plant. I thought they looked really cute grouped together. 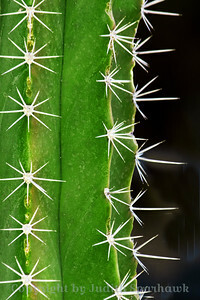 I really liked the patterns and repetition of the leaves of this plant, but it did look like it could do a little damage with those thorns. 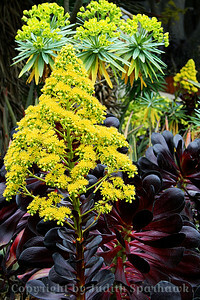 This is some type of succulent plant, which I saw at my son's house in San Diego. As long as I have known it, has had green leaves. 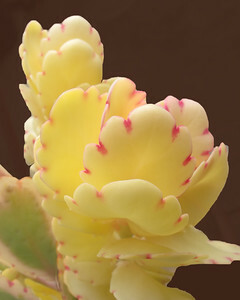 This time the new growth leaves were yellow, with these great pink markings. 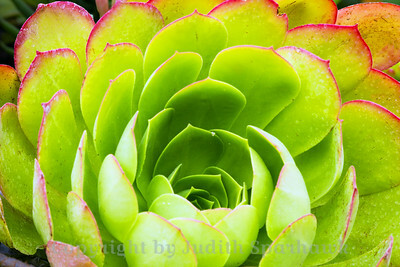 This pretty succulent plant was photographed at the Lavender Festival last year. I liked the colors and petal-like leaves. 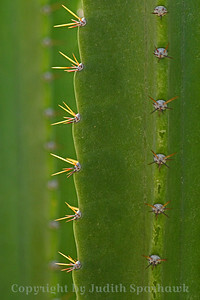 This cactus looked very different from most of those at the Living Desert, with only tiny spines, all along the edges. I liked the lines of the edges shown here. 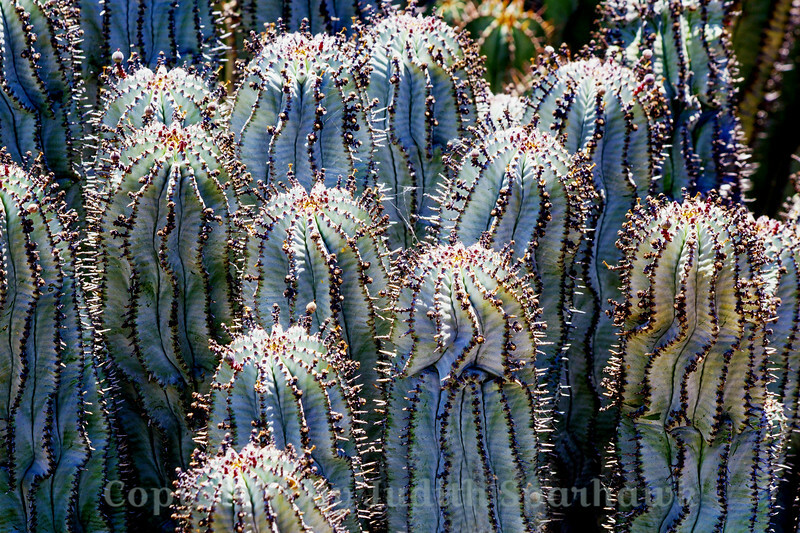 **This image was selected as Photo of the Day by Imaging Resources, January 31, 2018** This cactus was photographed at the Living Desert, Palm Desert, CA. 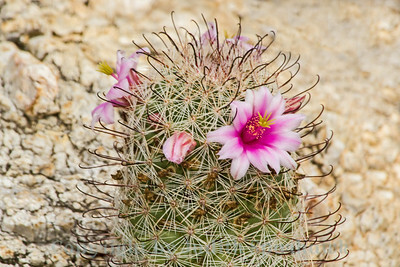 I liked the variation of colors, especially the pink and green stripes, with the star-shaped clusters of spines. 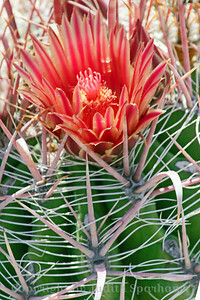 This round barrel type cactus grows one after another, all in a bunch. I've always liked how they look like a family of all different sizes and ages. 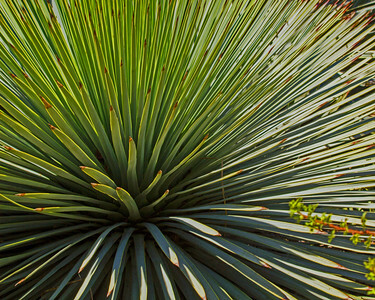 Living Desert, Palm Desert, CA. 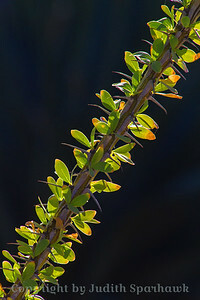 This is a close-up of the stem of an Ocotillo plant, with the sun coming through the leaves. 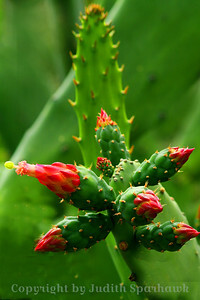 The stems are thorny and bare before the rains, with red blossoms at the tips of the stems. 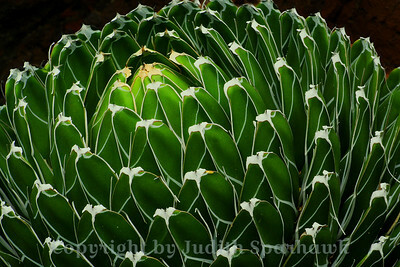 I liked the spiral formations of the ridges on this cactus. Whitewater Canyon Preserve, CA. Photographed in Morongo Valley, CA. 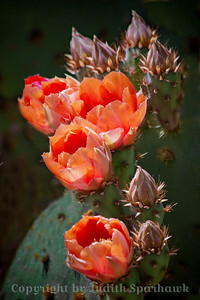 I loved the beautiful cactus blooms I saw in Morongo Valley, CA, as well as the 6 buds soon to bloom. 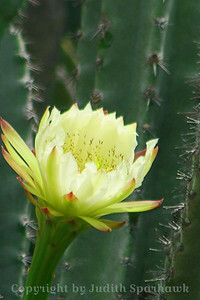 This was one of several cactus bloom photos I took in Morongo Valley, California. 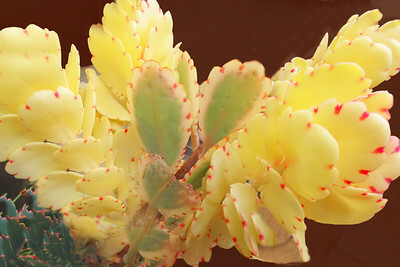 In August in southeast Arizona, these round barrel-type cactus bloom, forming a crown on flowers, yellow-to-orange, colors of sunset. 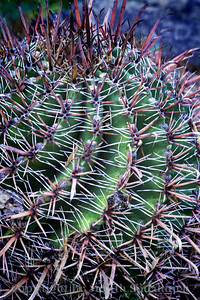 This strange-looking cactus was in Saguaro National Park in Tucson, Arizona. Eight shoots came out from a base, with buds coming to bloom on all eight shoots. The whole plant stood about 5 feet high. 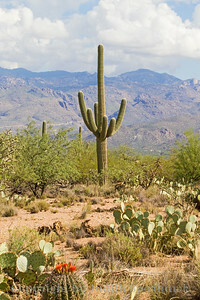 View of one of the large Saguaro cactus, with mountains and cloud. 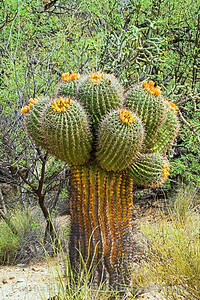 Saguaro National Park East, Tucson, Arizona. 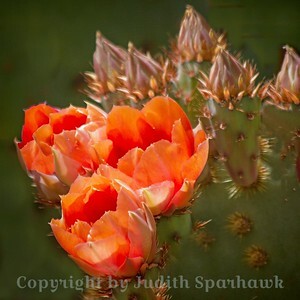 This pretty little flowering cactus was found at Saguaro National Park in Arizona. In a place with huge cacti, towering many feet into the sky, this little cactus was about 5 inches high, maybe 2 or 3 inches wide. It had dainty little flowers, and was a treat to find. 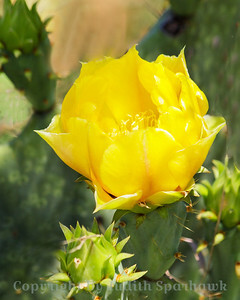 ~ April in Texas brings many yellow blossoms on the prickly pear cactus. 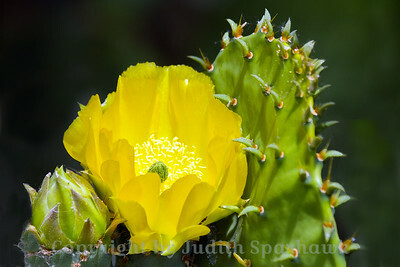 Cactus Beauty ~ A beautiful yellow cactus flower, April in Texas. 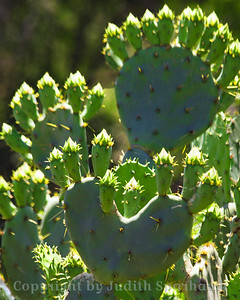 Blossoms-To-Be ~ These prickly pear cactus plants were loaded with buds. 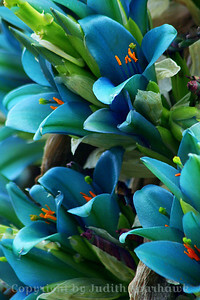 When they all bloom, it will be an amazing sight to see! 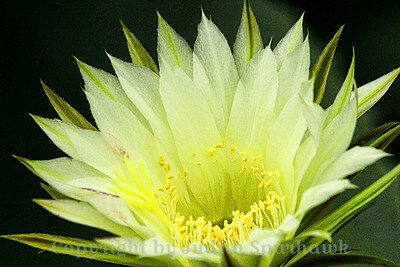 ~ This beautiful bloom lasts only one day, and usually blooms at night, so I was glad to capture it before it was gone. Huntington Library Gardens. One Night Stand ~ This beautiful Ceres flower blooms at night, to be pollinated by a certain moth, then wilts and dies the next day. This flower was still open and waiting for my camera, soon to be gone. Huntington Library Garden. 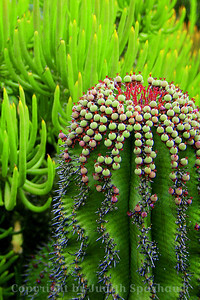 Flower Sprout ~ The Huntington Library cactus and succulent garden has some really strange plants. This one qualifies, I'd say. Strange, but interesting. 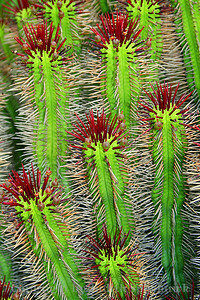 Cactus Cluster ~ These cactus buds were clustered together, about to bloom. Huntington Library Gardens. ~ Another shot of the beautiful turquoise blue flowers, cactus and succulent garden, Huntington Library Gardens, San Marino, CA. 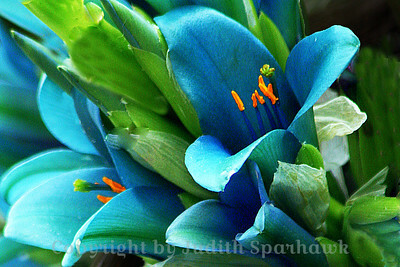 Blue Blooms ~ I didn't catch the name of this unusual plant, but I loved the color of the flowers. They were in the Huntington Library Gardens in Pasadena, CA. 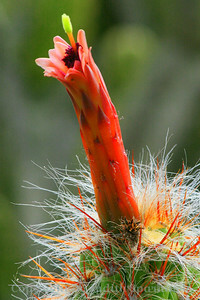 Cactus Flower ~ This pretty flower pops up from a not very special looking cactus stalk. Huntington Library Gardens. Cactus Family ~ This photograph is of just a very small portion of a group of this cactus, all nestled together. Huntington Library Gardens. 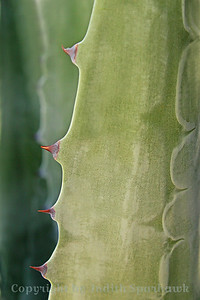 ~ This interesting plant was in the Huntington Library cactus and succulent garden. 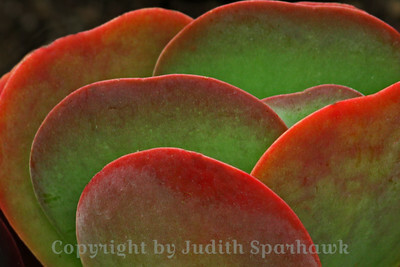 Red & Green ~ Close-up of a pretty succulent, opening up in an almost rose shape. Huntington Library Gardens. 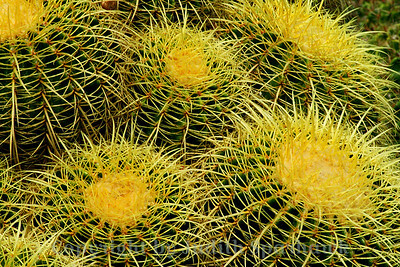 Cactus Balls ~ I liked the wavy pattern of the vertical rows on this cactus, topped off with round balls. What fun! Huntington Library Gardens. 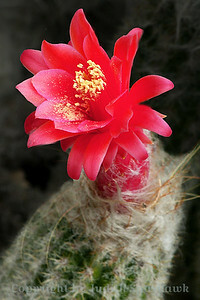 ~ This unusual cactus had red spines or spikes at the top. I liked the contrast in colors, and the repeated pattern. Huntington Library Gardens. 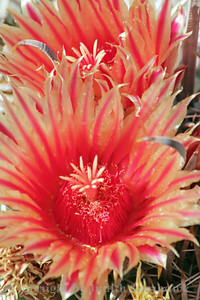 Solo Bloom ~ This flower was on a type of Barrel Cactus. 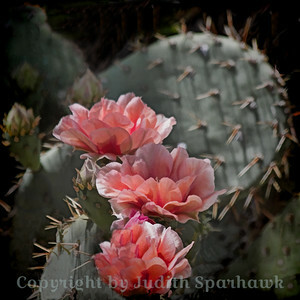 I liked the long pink spines on the cactus. 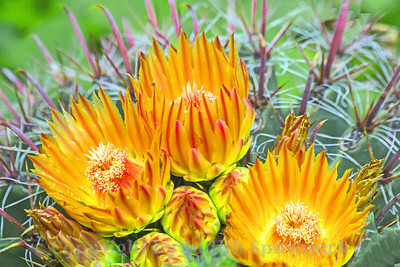 Barrel Cactus Bloom ~ These pretty blossoms were on a type of Barrel Cactus in the Living Desert in Palm Desert, California. I was surprised to see these blooms in November. 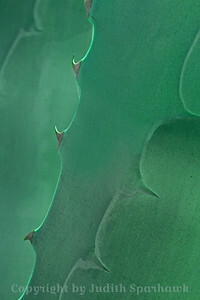 On the Edge ~ A view of a large cactus plant photographed in Desert Hot Springs, California. 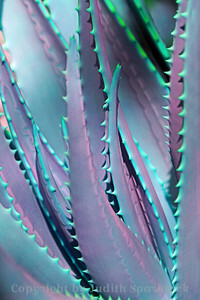 Aloe in Lavender ~ After shooting many aloe plants at the Los Angeles County Arboretum, I had fun playing with the colors on my computer. I liked this (very unlikely) lavender and turquoise version. Aloe in Green ~ During a trip to the Los Angeles County Arboretum, I visited the aloe garden, enjoying shooting the various lines, patterns and stripes of the many aloe species. This was one of them, in its natural colors. 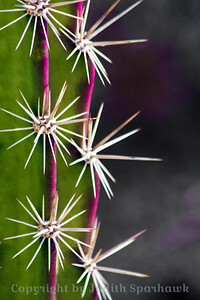 With Purple Thorns ~ The variety of colors and shapes of the succulent/cactus type plants made for a fun photo shoot. 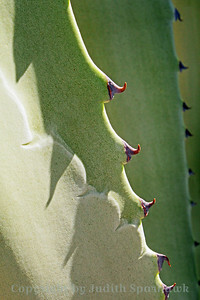 ~ Close-up view of the central stalk of the plant, showing the birth of the "leaves" of this plant, the formation of the stalks of thorns, and the patterns in the flesh of the plant. 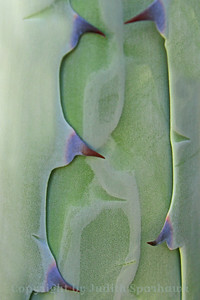 Layers ~ Another view of the layers and patterns of the plants in the garden of the San Ysabel Mission. 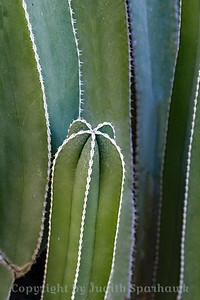 Thorns of Green ~ I spent a little while at San Ysabel Mission, enjoying the gardens, the chapel, and the historic cemetary. 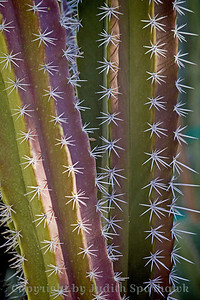 In the garden there were a variety of yucca-type plants, which I enjoyed shooting, making thorny abstracts.